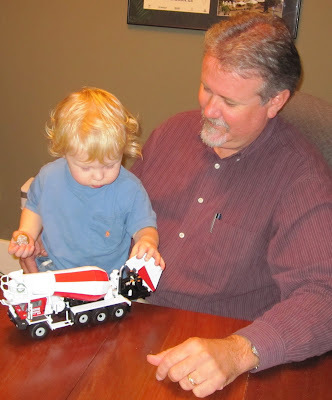 What’s better than Bob having a play date with project manager Cava’s son, Ulee? Do you want to wager a bet on who went home with the truck? As 2009 draws to a close, it is moments like these that we all cherish. With our Season’s Greetings, treasure old memories and anticipate the creation of new ones! A home is many things: shelter, a place to create family memories, a comfort zone, an investment. Whether your home is new, gently used or truly historic, it makes sense to maintain its value so that your home can be enjoyed in 2010 and beyond. Day-to-day living causes an inevitable aging process for any home. An active maintenance regimen can provide greater convenience and comfort for your family and can also prevent costly repairs before small problems become big ones. The thought of staying on top of everything in a home can seem daunting. Classic's Home Care Solutions will ensure that your home is kept in exceptional shape, while keeping worry and hassle to a minimum. You schedule annual visits with your doctors for a check-up. You visit your auto mechanic every 4,000 miles for an oil change. As with these preventative measures, scheduling an annual check-up for your home can often avoid costly repairs by catching problems while they are still small and less costly to manage. Whether you conduct these surveys on your own or call us for assistance, discovery is the first step toward problem prevention and resolution. Annual inspections of your roof, exterior surfaces and crawlspaces for signs of normal wear and tear, or water damage from peeling paint/finishes or aging roofs, improper flashing or leaking appliances, is critical to maintaining your investment. With simple weatherization repairs, the average home could see significant decreases in their energy costs. The Classic Home Care Solutions Team will identify areas in your home that need additional caulking or insulation; these simple solutions can make your home “air-tight.” Weatherization not only makes your home more efficient, it also provides a greater level of comfort for the entire family. With Classic Home Care Solutions, you will receive prioritized service for unexpected, time-sensitive needs, such as emergency repairs, hurricane preparedness and other projects that may need to be fast-tracked. While you’re making your resolutions for 2010, please consider resolving to add your home to the list. What better way to safeguard your family’s significant investment, than with Classic Home Care Solutions. With The Preservation Society of Charleston's long standing commitment to feature architecturally significant private dwellings, we were honored once again that one of our client's homes was showcased in the 33rd annual Fall Tours of Homes & Gardens. This Historic Charleston home, along with inspiration from its loving homeowner, fostered Classic’s niche by perfectly melding old with new, as is evidenced in this photo of the gorgeous kitchen complete with a center island designed to cover the existing cistern below. The Radcliffeborough neighborhood tour, where this home is located, features historic and elegant mid-19th century residences, including examples of the Charleston single house, built for both planters and merchants. The home is currently occupied by a delightful couple that truly understands the value of the historic, one-of-a-kind community that we call Charleston. Classic will continue to do its part in fostering its commitment to maintaining architectural integrity that preserves the legacy of Charleston. The below excerpt appeared in the Saturday, October 10 Real Estate section of the Charleston Post and Courier. The Johns Island “design-build” venture has been named among the leading remodeling outfits in the U.S. Classic Remodeling & Construction Inc. made the Top 500 list of Qualified Remodeler Magazine for 2009. The magazine cited six criteria in selecting its top 500: years in business, sales volume for the previous year, association memberships, certified employees on staff, industry awards and community service. Qualified Remodeler unveiled the list in its September issue. “The remodeling industry, like most others, has been challenged to adapt to our ever-changing economy,” says Bob Fleming, president of Classic Remodeling & Construction. “As we maintain the original design-build services we’ve offered to our clients over the past 20 years, we’re also focusing on developing other services,” he says. Fleming noted that the firm’s Specialty Services team focuses on smaller projects, repairs and maintenance. “It draws from our time-tested design-build process but provides a streamlined approach with quicker turn around,” he says. This is the second straight year that Classic Remodeling landed on the Top 500 list. 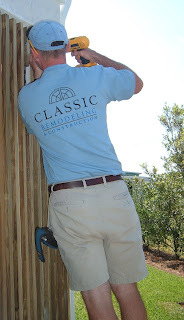 For more information on the company, visit its Web site at www.classicremodeling.com. Small fixes and simple solutions for your home. With the Specialty Services Team, you get much more than a random handyman with a tape measure. You get our in-house team that will work with trade partners to coordinate all aspects of your project, regardless of size, and our commitment to leverage the collective experience of over twenty years of service to the Charleston area. A Specialty Services consultant will work with you to identify your needs, propose solutions and carefully work within your budget. A skilled master craftsman will carefully carry out the plans while minimizing impact on your daily routine. Let Classic take on all your small projects, repairs, and continual upkeep. Why gamble on fix-it projects gone awry? Rely on the area’s most trusted name in remodeling for all your small fixes and expedited solutions around the house. Develop a personal List of Goals. · Do not rush or make hasty decisions. Establish a Time Frame that suites your expectation for a completion date. · Understand your responsibilities and those of your contractor that must be met in order to meet milestones. · Take time to investigate a firm prior to calling them. It is usually best to call a firm that is recommended to you by family, friends or co-workers. Consider the person’s standards as you assess the value of their recommendation. · Ascertain length of time in business. There is often value in longevity. · Ask if the firm participates in a 3rd party satisfaction company. If so, ask how you can assess this unbiased information. · Visit the web site and evaluate its appearance, thoroughness and helpfulness. This might be your first insight into their attention to detail. Put the firm to the Test. · Ask for a list of references and call them. Ask these people about particular areas of interest or concerns that are relevant to you. · Ask for a list of trade partner references. Call and do the same with them. · Tour jobs that are in progress as well as completed projects. · If you are entering into a project that requires design elements it is usually best to use a company that specializes in design-build services. This means the firm has actually designed what will be constructed. Design – Build specialists have a complete understanding of all elements of the job from concept to completion. · If Design-Build is implemented it will require details such as floor plans, elevations, wall sections, 3D drawings and renderings. · Avoid overly complicated designs because they are often by nature more costly but more importantly may not blend with the existing structure. · Embrace designs that subtly blend with the existing structure. · Even smaller repair and maintenance projects should be explained and fully understood. Make sure you are given a detailed Estimate. If applicable, make sure you are aware of the dollar amount stated in your estimate that is allocated for the purchase of specified items that you will need to select. · Make sure you understand what the policy is if you are over or under the costs for your designated selections. Get right with what’s to come. Certain firms work harder to ease the discomfort of having your home disrupted. · Determine what the contingencies are when, for instance, your kitchen is dismantled. Does the firm have the ability to set up a temporary kitchen? · Will efforts to be made to protect your property? Will dust barriers and daily upkeep of grounds and interior spaces be performed? · Communicate effectively and consistently and expect the same from your firm. Make sure that you have 24 hour access to your Project Manager in the event of a project emergency. · Remember the joy that will come with the finished project and that you and your contractor will be working together to fulfill your goals. · You should be given ready assess to the team that will be working on your project. In many cases this will be an in-house designer, selections agent, project manager for on-site supervision, as well as the project craftsmen and trade partners dedicated to your project. Often the company owner serves to be a key component in the pursuit of quality and warranty issues down the road. A comfort level with that person is often crucial to your end satisfaction. · Make sure the firm you choose can verbalize their processes and that you understand them and how they relate to you and your project. Wouldn't it be fun to bask in your old fashioned tub while looking out at your privately landscaped backyard retreat. 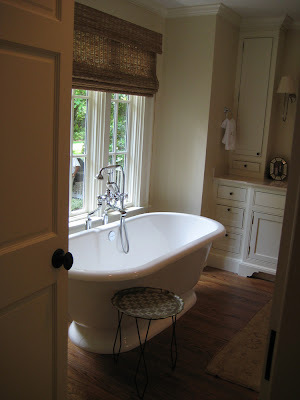 Bathroom remodeling in Charleston, SC is rewarding for our team and for our clients. Creating retreats within the home have always been important but seem to have added value these days as "staycations" are embraced and enjoyed by all family members. 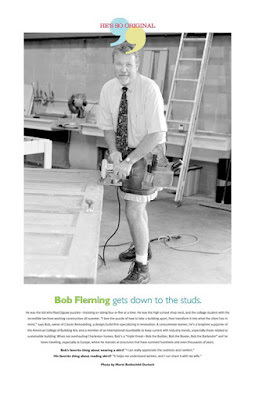 Never in a million years would anyone wager that Bob Fleming would be caught wearing a skirt and smiling. Check out the June issue of Skirt! Magazine and consider his new (and very temporary) fashion trend. Not only can Bob add his unique flare to homes throughout the Charleston, SC area, but he can make a skirt look pretty good as well! Now is the time to move forward with your remodeling plans! Remodeling is a wise investment to ensure longevity, usefulness and home value. Here are four reasons why today's economy may mean good news for you. 1. Although banks have tightened their standards, they are still eager to write loans for homeowners who have a good credit rating, at least 20 percent equity left in their home and proof of a steady income. 2. Recent Federal Reserve cuts have lowered home equity rates, making them even more attractive. The national average for a $30,000 home-equity line of credit is 5.5 percent. The rate for a home-equity loan for the same amount is around 8.84 percent. 3. Most construction materials are readily available and many have come down in price. You may also get some items quicker due to less demand. 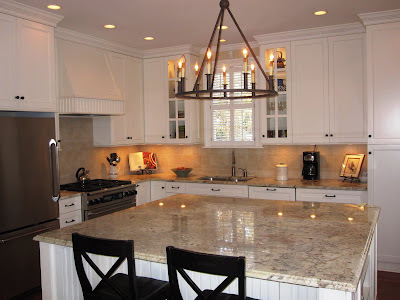 Are you ready to get started remodeling in Charleston, SC, whether it be kitchen remodeling in Charleston, SC, bathroom remodeling in Charleston, SC, a renovation, or the services of our Specialty Services Team for smaller projects, we look forward to hearing from you at 843-763-3297. Bob Fleming, of Classic Remodeling and Construction, Inc. in Charleston, SC has recently been selected as President of the local chapter of the Charleston Builder's Guild. This organization was created to bring innovation and strength to the custom and independent building industry. Because of our relationship and that of other builders both locally and nationally that have joined CB/USA we are successfully forming allies to help us save on building costs and strengthen business in ways they could not be done on our own. What does this mean for our clients? It means better pricing and even better service from our trade partners. This relationship is a win-win and one that Bob is looking forward to enhancing. Classic Remodeling and Construction, Inc of Charleston, SC was named by Qualified Remodeler Magazine as one of the Top 500 remodelers in the country with Classic ranked at number 169. This recognition is based on the dollar volume of remodeling activity performed. Several factors contributed to Classic being able to earn this distinction. Among them is Classic’s in-house Design ∙ Build focus, their 20 years in business, their involvement with the National Association of Home Builders, Remodelers Advantage Roundtable, the Chamber of Commerce, and as an A + Accredited member of the Better Business Bureau since 1989. Earning industry awards specific to the design and implementation of projects, an exemplary customer service history as recorded by Guild Quality®, along with community service involvement, helped to once again expand the view of Classic Remodeling to this national level.